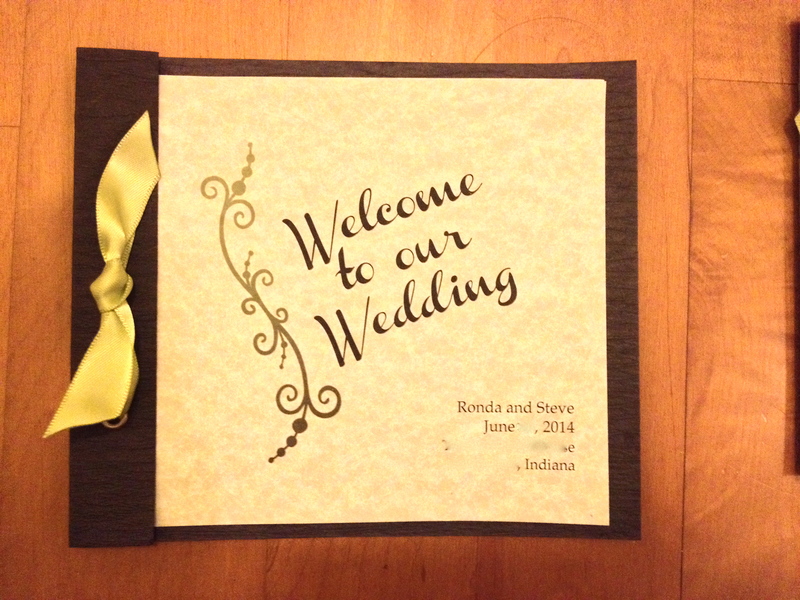 I wanted programs for our guests. I wanted them to know who was who, what to expect, and more about the beautiful building they are visiting. Besides, I wanted them to have something to keep them occupied while they waited for the ceremony to start…Perhaps it’s just me, but I’ve sat through many a graduation ceremonies with nothing to keep me company other than the program. 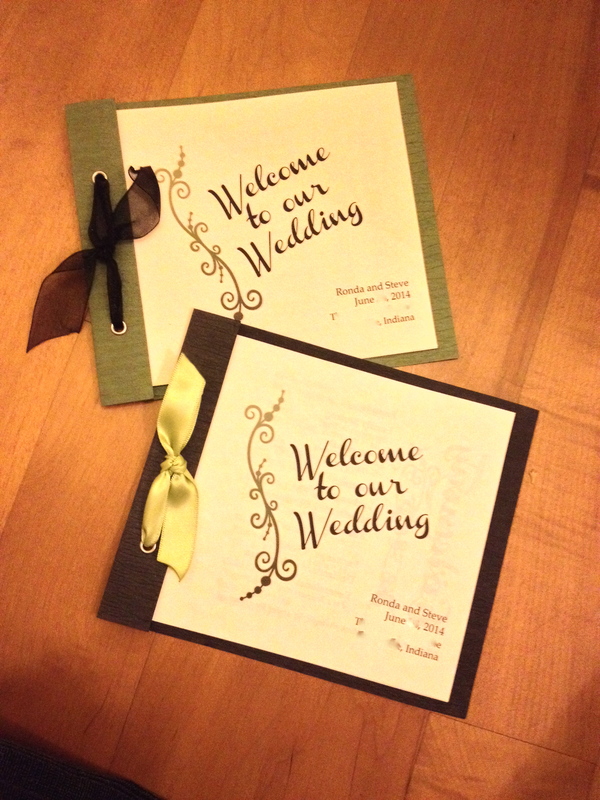 Two versions, above green cover paper with ivory bond paper; below black cover with green bond paper (hard to tell it’s green in the photo). 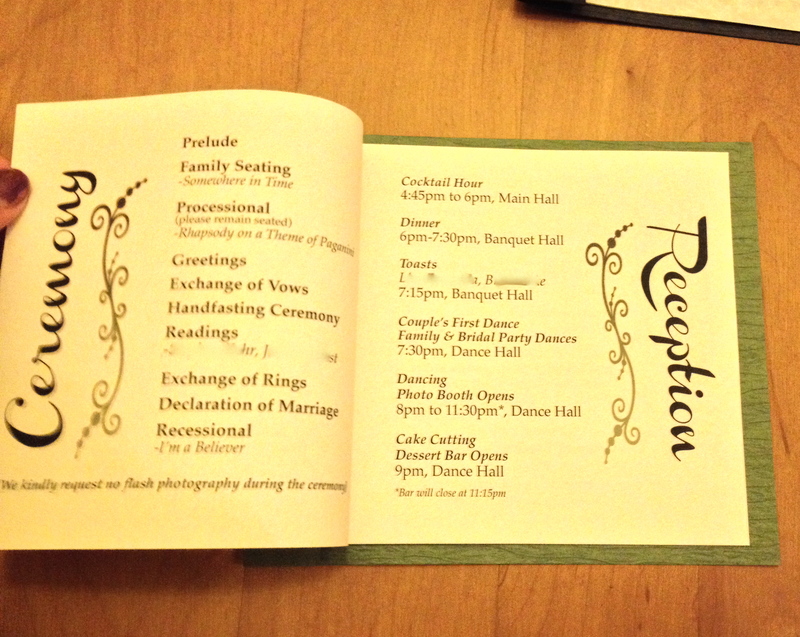 The programs are small (6″x5″), but very readable (14 point font), 9 pages long, but less than the thickness of a dime. 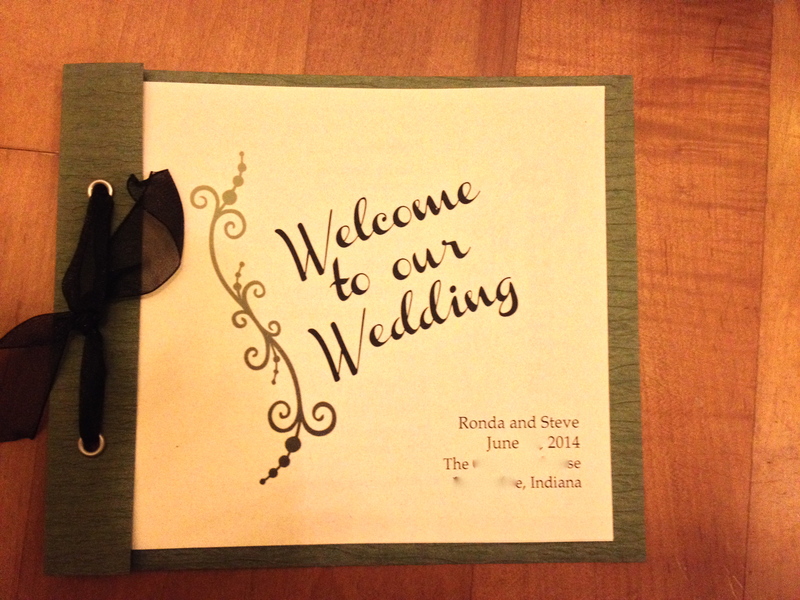 Some additional information (bunch of professors and trivia buffs at our wedding)–gives guests something to read if they arrive early. 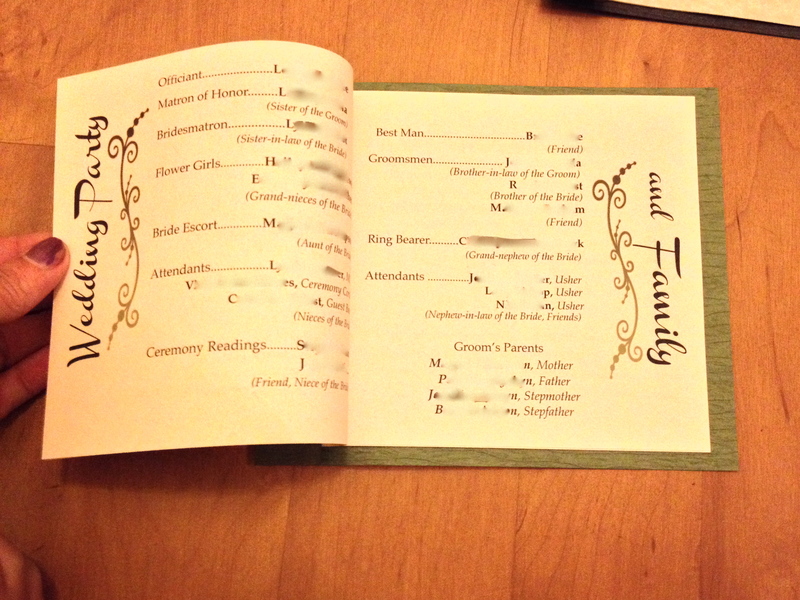 Double sided printing and binding can be a bit mind-numbing, but it really isn’t difficult. 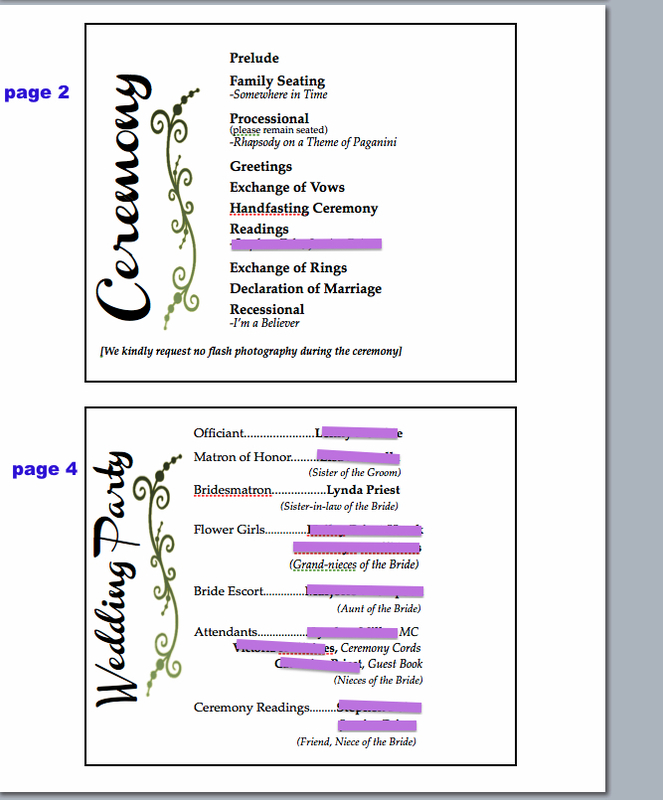 To avoid the trial and error (and wasted paper/ink) here are steps with pictures of the layout. 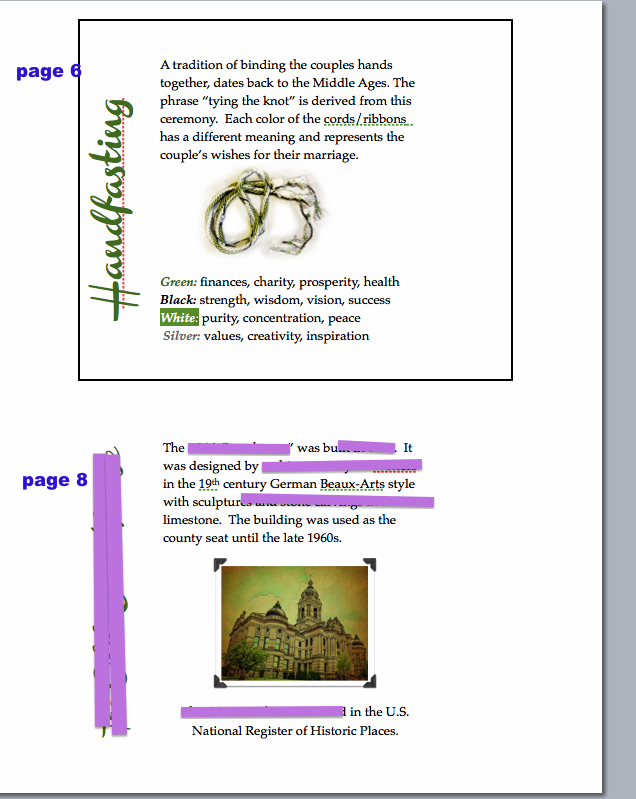 In your word processing program create text boxes of equal size (mine are 6″x5″). To bind on the left side as I did, leave a 1″ margin on the left side for odd numbered pages and a 1″ margin on the right side for even numbered pages. 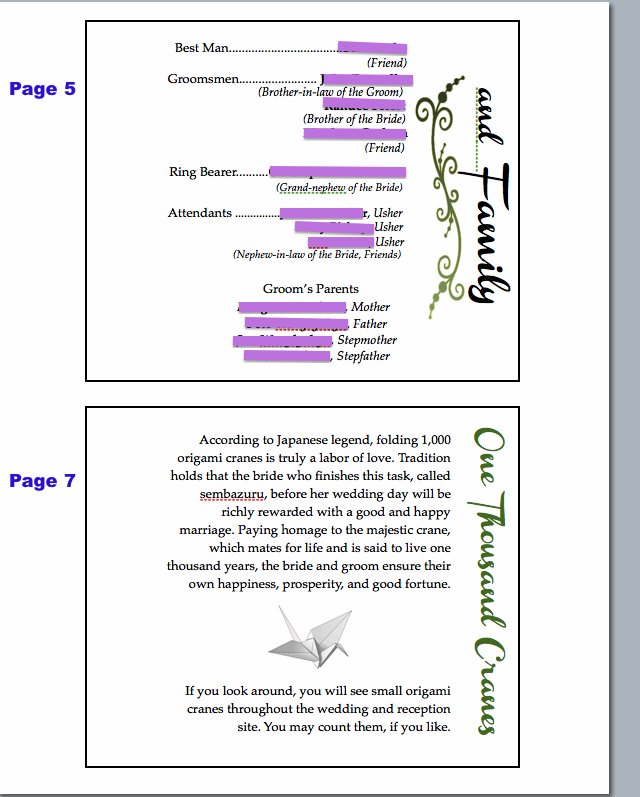 Make sure all of your text boxes are lined up the same on each page (if you uses iMac Pages, this is really easy). 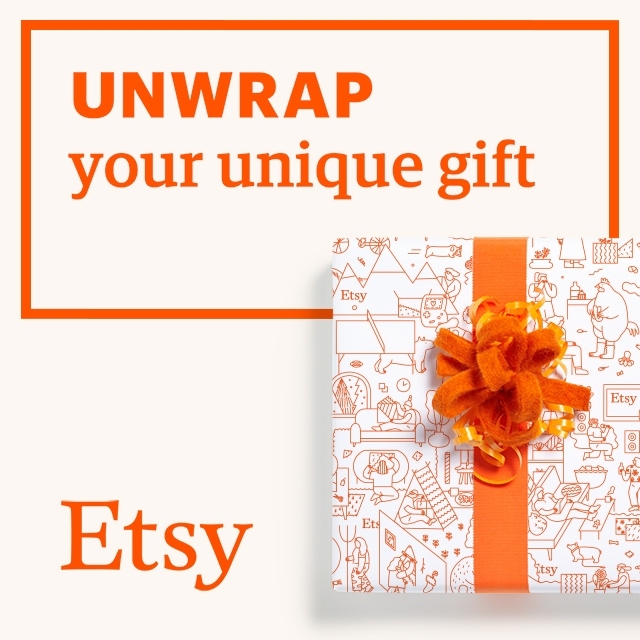 You can create the first page with two text boxes, and then just duplicate that page as many times as you need–that way all the text boxes will be in perfect alignment with one another. I strongly suggesting testing the double print on your chosen paper. You want a heavy enough bond (paper) so the double sided printing doesn’t show through to the other side. 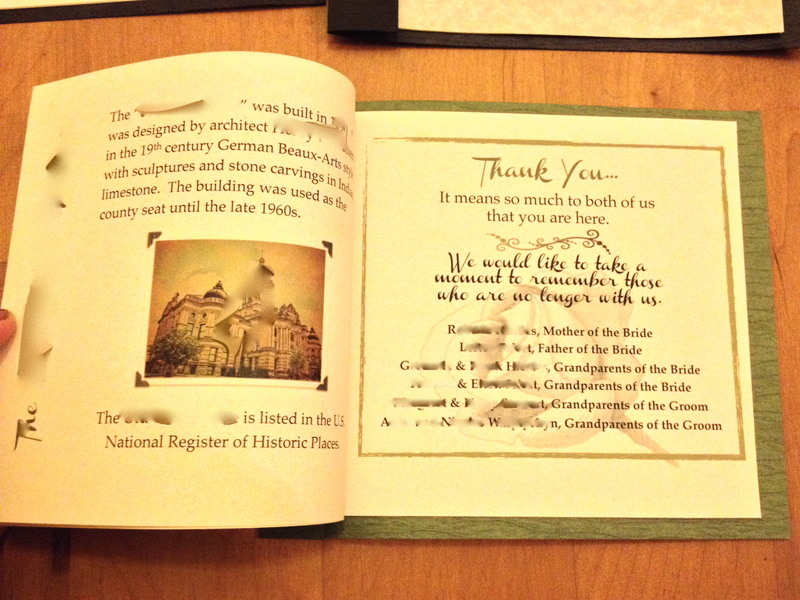 Your page numbering order is as shown in the photos, and then print using your double sided -capable printer (long edge binding setting). Or you can manually do this with a printer/copier by printing only the odd number program pages and then flipping the paper over to print the even sided on the other side. To assemble, cut all the pages to the size of the text box (if there is a line around your text box, use that as a guide). A guillotine cutter is your friend–you can cut multiple pages at a time. 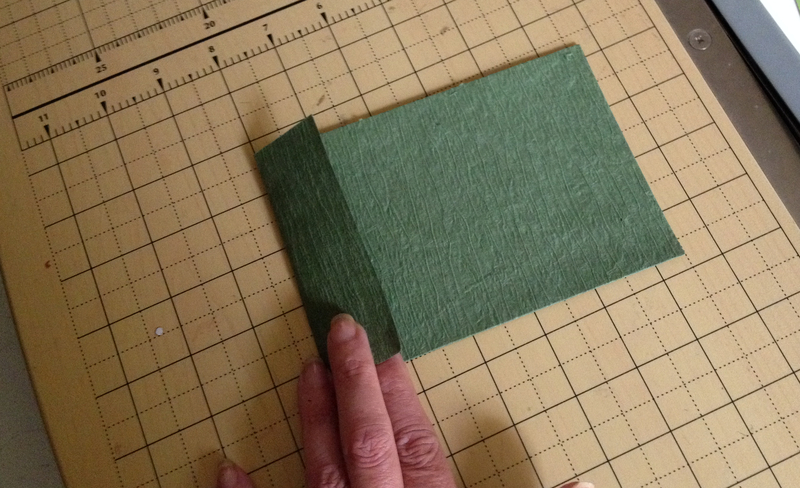 To create the “cover”, cut a piece of card stock 1.5″ longer than your pages and 1″ wider. For my 6″x5″ program pages, I cut card stock strips 7.5″ across and 5.5″ high. I cut two pieces of program covers from one 12×12 piece of paper. 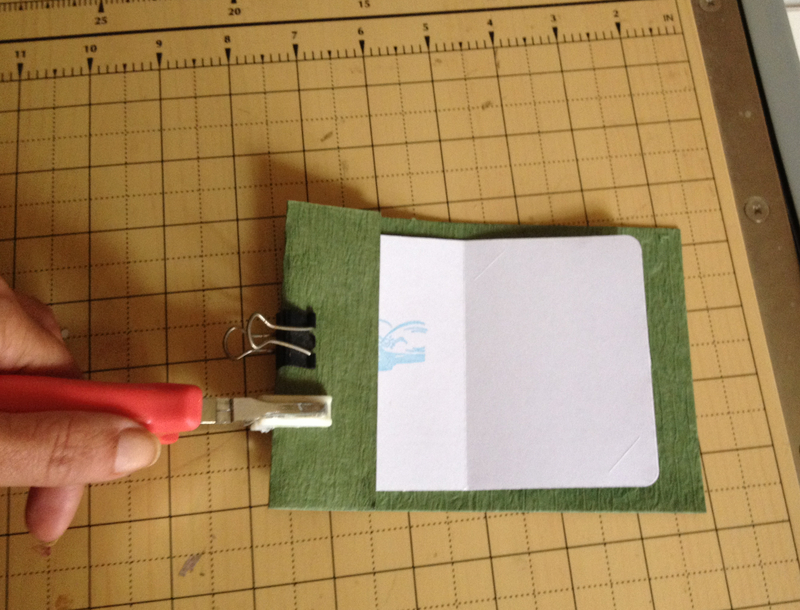 Fold over your cover card stock 1″ on the left side, slide in your pages (in order!) and make sure everything looks nice. Use a binder clip to hold everything together and punch two holes through all pages and cover. Optional step: insert eyelets into the holes you just punched. Thread ribbon through the holes and tie securely. This is your binding. 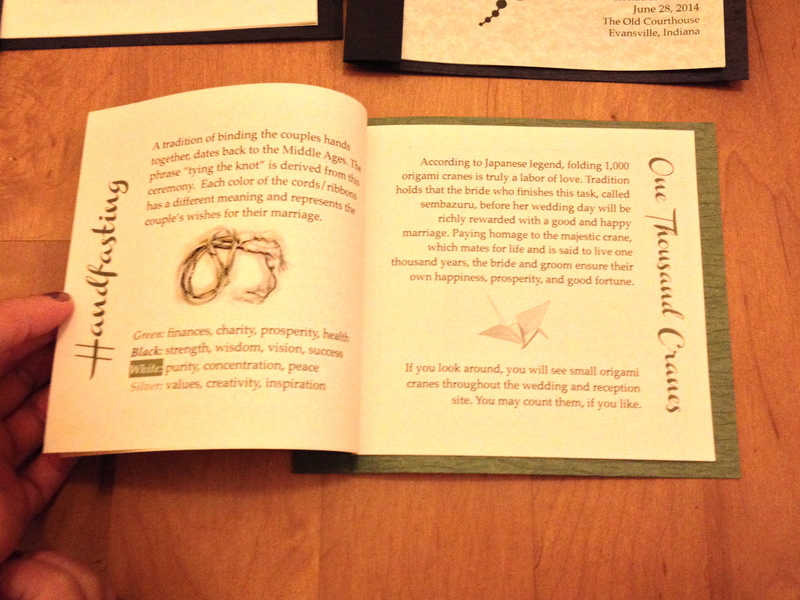 I made 85 programs for approximately 120 guests, figuring some couples would only take one. How much time did it take? Designing them took the most time. 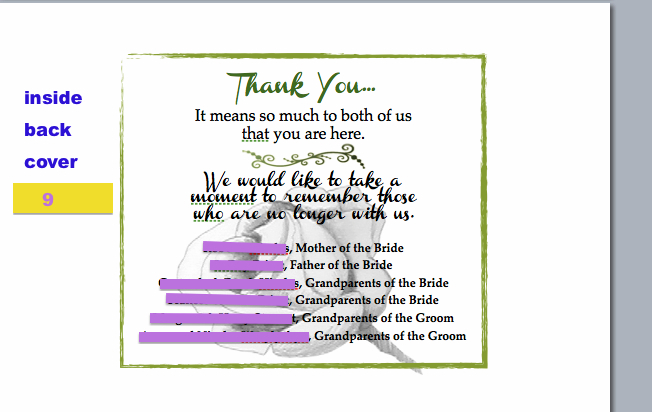 I started them nearly a year ago, our best man changed, some the time line changed….I waited to print them for as long as I could. I probably worked way too long on the design tweaking this and that, getting the spacing just right, etc. 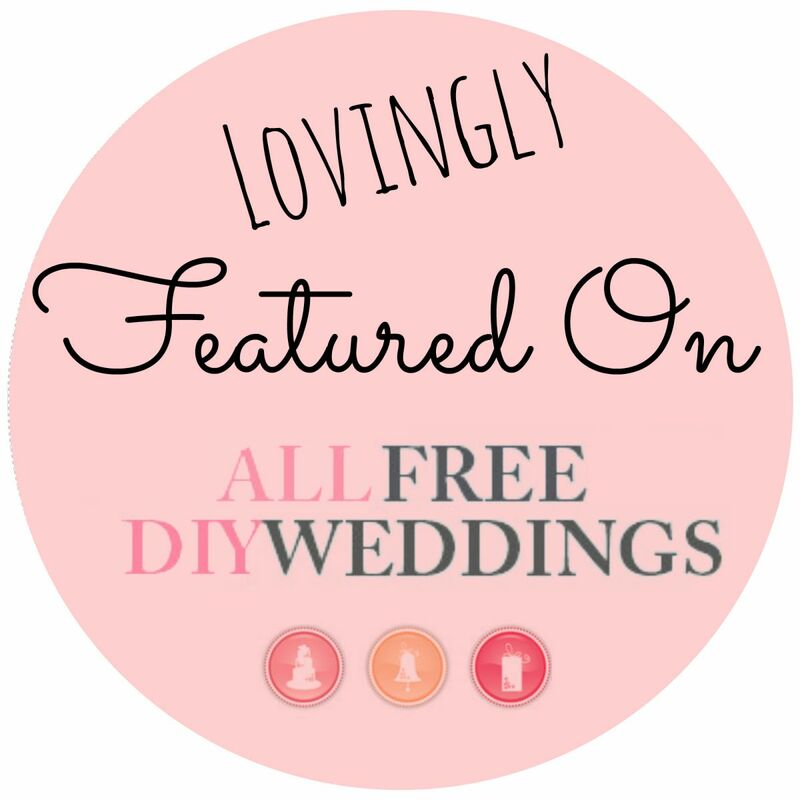 But allow yourself at least 3-4 to do this and make sure you get someone else to edit them (up to the last minute, I still had “groom” spelled wrong!). 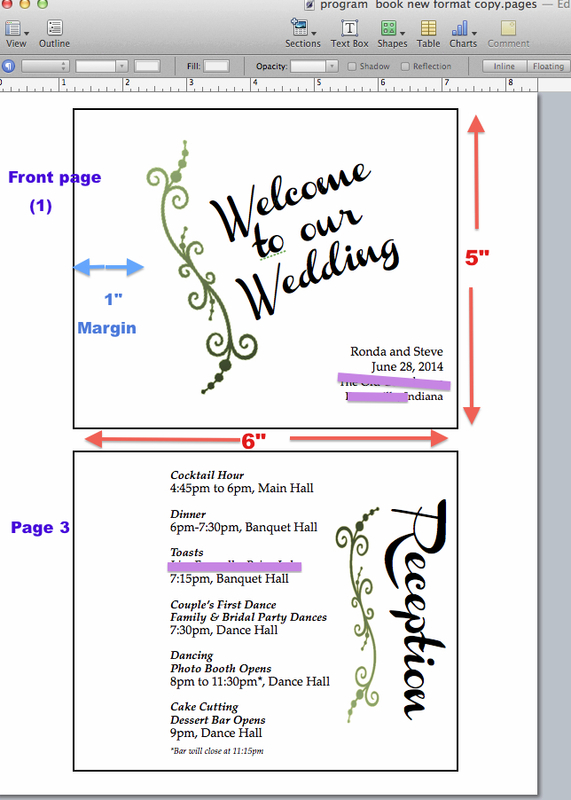 Printing & cutting takes maybe an hour–with a guillotine cutter. 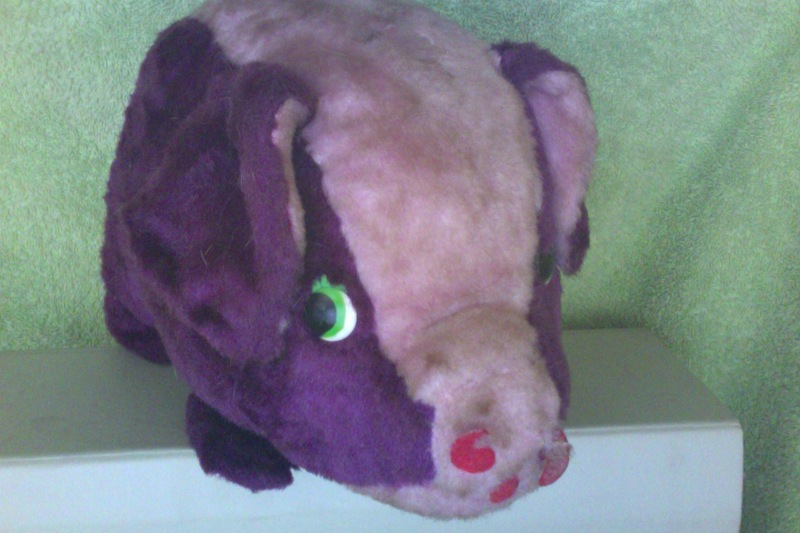 Final assembly took me 2-3 hours, but I also had the extra step of eyelets, which were not really necessary. I also seared the ends of the ribbon so they would fray, which adds time.